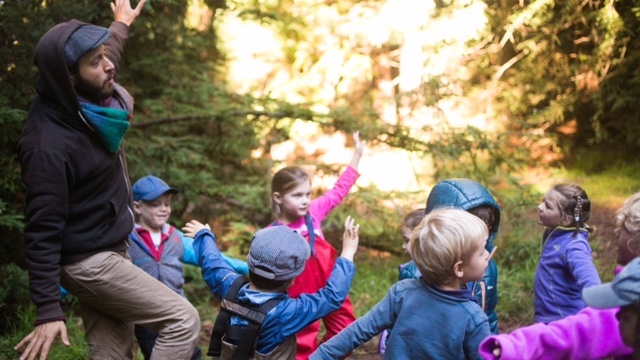 This program incorporates early learning best practices and ecology education to create a holistic learning experience designed for children ages 5-6. We use storytelling, nature and mindfulness games, free play, expressive arts and social mentoring to nourish children's relationship to self, one another and the natural world. The Coyote kindergarten class includes in depth and long-term projects based on age-appropriateness and also incorporates parent involvement as a foundational element of community learning. In this class, each family is committed to contributing either though teaching, bringing a special project or supporting the community in other ways for one day each season. This is a class on the move and we will be utilizing the rich natural community around us to explore by changing locations based on the season, field trips to follow the children’s learning, and taking part in family gatherings outside of the school day. Tuition is paid in 10 installments, beginning with a deposit upon acceptance and ending in May. The deposit is used to pay the final June installment.